Introducing Zerona – 60 second from Primcogent on Vimeo. Learn more about this revolutionary procedure at this special event. Talk with Dr. Stevens, Zerona Representatives and see amazing case results for yourself. The cold laser technology behind the Zerona procedure was shown to exclusively release the cellular contents of fat cells while leaving the capillaries and other cells within the interstitial space intact. 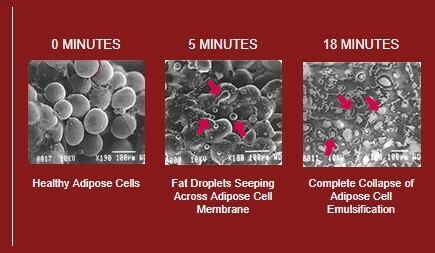 The release of the fat cell contents is the result of the disruption of the cell’s membrane. This membrane disruption, called a transitory pore, is the result of low-level laser stimulation. Unlike other non-invasive approaches, Zerona low-level lasers do not rely on heating of freezing tissue, which can cause discomfort. There is no pain, no downtime, so clients can resume their normal activities immediately after the treatment.